At a local upscale grocery store I spot a soda I've yet to review. Steaz Blueberry Pomegranate flavor is the aforementioned product and honestly a blueberry pomegranate mix sounds bit scary. But, I've probably had worse, so I make the purchase and cart the newly acquired bottle back to the small apartment I call home. I would like to add that I purchased some rather stout coffee in case my newly acquired drink doesn't fit the bill. With the newly chilled bottle in hand I decide to scan the label to see just what I'll be consuming. It dawns on me that the time to read the label was probably at the store, but late is better than never, and what would a review be without some mention of what the drinks ingredients are any way? So I look over the ingredients list. First this stuff has zero calories, a good start if one finds calorie content important. Organic flavors and filtered sparkling water are part of the mix. 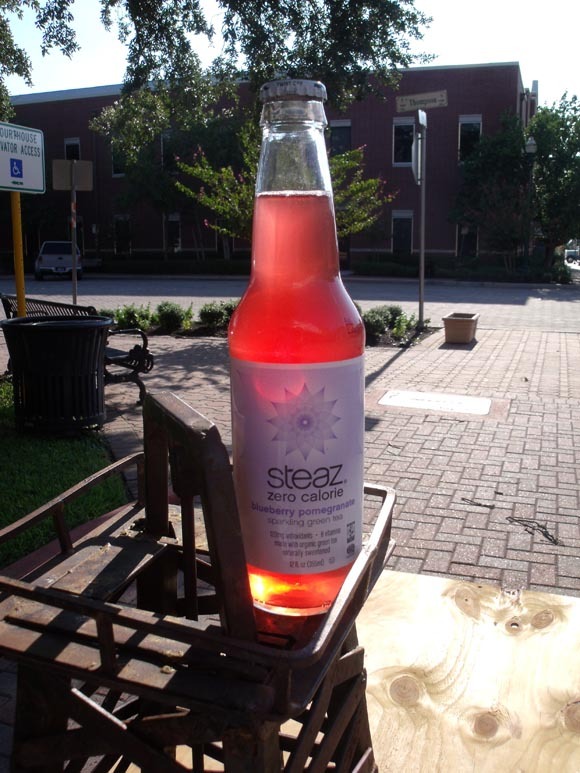 One thing that is worth mentioning is that Steaz is sweetened with the Stevia. For those of you who are unfamiliar Stevia, it is an all-natural alternative to sugar. The only catch in my opinion is that Stevia doesn't taste very good at all, and by not very good I mean horrible. So at this point I don't think my Steaz experience will end well, but there is only one way to find out. So the top is off and I don't detect any smell. So far, so good. So I cross my fingers and take a large gulp. Not bad. Not great either. It does taste like blueberry and pomegranate, and I must say the flavor is a good mix of both. But the sweetener smacks me in the mouth, almost literally. To be honest the sweetener isn't strong and is almost completely masked by the Blueberry and Pomegranate flavoring, but it still stands out and doesn't get any better the more I drink. So I finish the bottle to give the drink a fair shot. After some reflection I find the overall taste to be poor due to the sweetener. Also there is an aftertaste that closely resembles Stevia, and that is not a good thing at all. Looks like I'll need to drink that coffee after all. Final Review: Buyer Beware! Steaz Blueberry Pomegranate has decent ingredients but has a taste that resides somewhere on the bottom end of poor. If you’re a fan of the Stevia, then Steaz is a good buy. If not, look elsewhere.